The enduring love of Christian faith is brought to life in this unique creation from Apples of Gold. A two-tone gold pendant cross is lovely in every way with this design. The cross is forged of 14K yellow gold and features detailed etching on each arm. The center of the cross is home to two 14K white gold hearts that interlock to form a special bond. This elegant style is a perfect portrayal of the uniting love that Christ brings. 20mm x 14mm (13/16" x 9/16"). 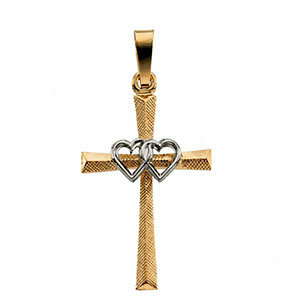 We guarantee our Dual Heart Cross Pendant 14K Two-Tone Gold to be high quality, authentic jewelry, as described above.